The LidgetCompton Pent Mansard Deluxe Package garage has been designed to last a lifetime. 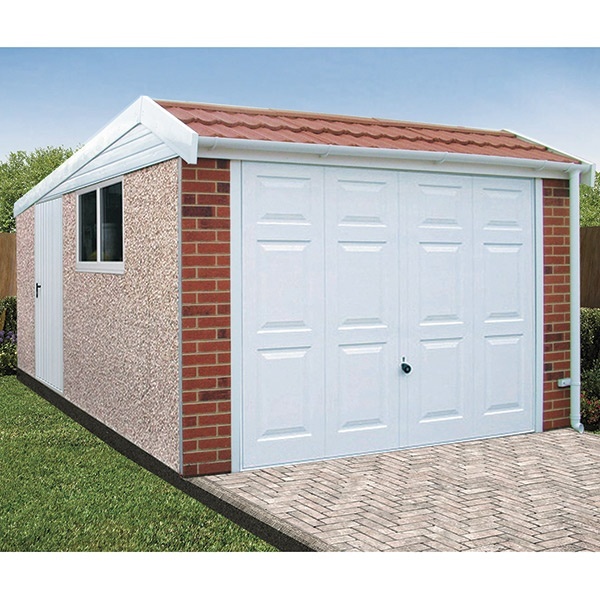 Made from reinforced concrete and finished with uPVC fascias and vergeboards, these high quality garages are not only strong and secure, but they are maintenance-free too. The Pent Mansard Deluxe package inludes a stylish Georgian style up-and-over door, a 3' (0.91m) steel personnel door plus a 4' (1.22m) double glazed fixed uPVC window. And don't worry about the layout... you can choose where everything goes when you place your order! You can also choose the colour of your hand-pointed real brick front posts, idead for colour matching to your home. Both choices upgrade all windows, doors and fascias to the above colours. Why Choose A Deluxe Package? The Deluxe package offers great value for money. This exclusive range is brought to you at absolutely rock-bottom prices! Both attractive and practical, the stylish Georgian up-and-over door includes security enhanced 4-point locking - meaning your possessions stay safe and secure! Do you need an additional entrance to your building? The 3' personnel door can be positioned wherever you need it. The door includes 4-point locking, dual-latch centre locks and a stainless steel security plate for extra security - fitted as standard. The Pent Mansard has an attractive Metrotile front elevation roof where you can choose between 6 attractive colours! The rear of the roof is robust C section galvanised steel rafters supporting a galvanised steel roof, with Grafo-Therm anti-condensation treatment and no joins. At 4ft wide, the uPVC window allows plenty of light into your garage. With the window being fixed and double glazed, security is not compromised. A standard LidgetCompton garage is supplied with timber fascias and vergeboards. These will require preservative treatment over time, meaning extra work for you. Our Deluxe package is supplied with uPVC fascias and vergeboards as standard - meaning virtually no maintenance, aside from an occasional wipe clean! Choose from 3 colours (black, white or brown). The uPVC guttering is fixed to both sides of your building to prevent any dirty water discolouration. The stunning brick effect front posts allow you to match the building to your home for a seamless extension of your existing property. Available in 4 styles: Autumn Red, Warwick Red, Reclaimed or Southern Stock. Nobody wants rainwater inside their building, so a sand and cement fillet is laid around the internal base of your building - helping prevent water ingress, whilst giving a neat appearance where the garage panels meets your base. No need to worry about additional delivery charges - delivery, installation and VAT are all included! A 10 year structural guarantee ensures that you have peace of mind for the long term! We have a whole host of customisable features available on our standard garages. These include brick/stone wall finish, stone/PVC garaclad wall finish, rollershutter doors, transparent roof sheets, lining clips and more. Contact us for more details. At an additional cost you can upgrade the uPVC fascias, uPVC window, the up and over door and the personnel door to a Decograin finish in either Golden Oak or Rosewood. The building here features the Golden Oak Decograin and the uPVC gutters are brown to match the Decograin. The Pent Mansard Deluxe garage features many upgrades as featured here. The up and over door has been upgraded to a Georgian up and over door, hand pointed real brick front posts have been added to the building, the window is a 4ft fixed uPVC window, a 3ft wide steel personnel door is included, uPVC guttering to the rear has been added and all fascia’s and vergeboards are white uPVC. The metrotile front elevation is available in a choice of 6 colours. 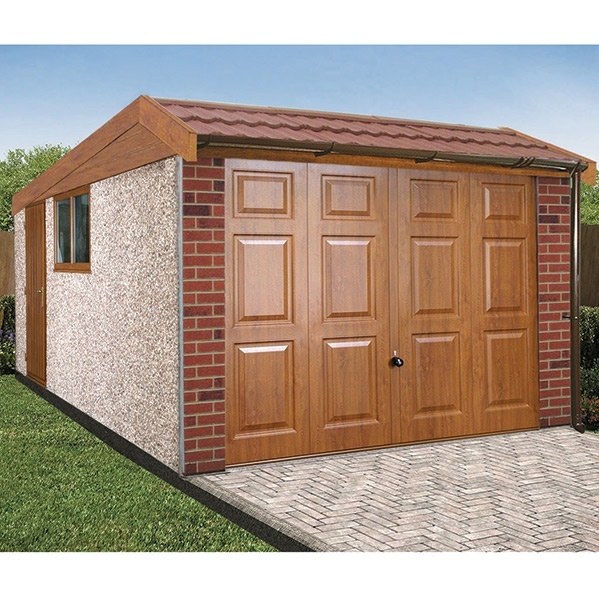 This gives a maintenance free garage that is also a stylish addition to any property. All Deluxe garages include delivery, VAT and installation as standard. You’ll also get peace of mind with a 10-year manufacturer structural guarantee. Where Can I See LidgetCompton Deluxe Garages?